It is the first hour of the first day of ninety-one students’ first year of high school. Members of the freshman class are seated on the bleachers of the gymnasium with collars popped, ready to add on the final part of their new professional uniform. Together, they will learn the ins and outs – and overs and unders – of tying a tie. Truth be told, this annual Tie Ceremony is actually about much more than tying a tie. The ceremony only lasts fifteen minutes, and few students, if any, will leave the gym having mastered this new skill. Many will, with the help of a teacher, get a decent knot in their tie and then leave it there for the duration of the year, cautiously loosening each evening to slip it over their head and delicately retightening each morning, careful not to let the knot come undone. Why then do we put so much emphasis on this ceremony? Like so many things, for us at Boston Prep and in the world of public education, this is deeply personal. As a founding teacher at Boston Prep, I have led every one of the Tie Ceremonies over the past twelve years. When I was the age of these students, I did not myself know how to tie a tie. In fact, I was first introduced to a tie thirty years ago, to the day, of this year’s Tie Ceremony. I was raised by my mother, and I was preparing to leave for college, flying from California across the country to New Hampshire, when my grandfather discovered that I did not know how to tie a tie. In a last minute effort to ensure that I could be fully independent as I took this major life step, my grandfather boarded the flight with me, and the next morning, on the day I would move into my college dorm, he taught me how to tie a tie in front of the mirror of our hotel room. 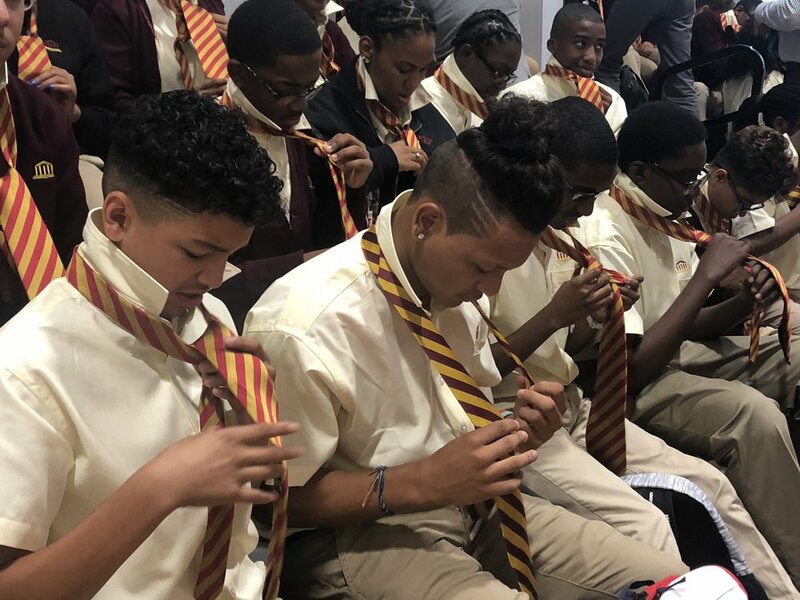 At Boston Prep, we ask our high school students to wear professional uniforms, including ties, for many of the same reasons my grandfather wanted me to know how to tie a tie. As the well-known saying goes, “Dress for the job you want, not the job you have.” As educators, we always have our sights set on our young people’s future. We talk regularly with students about college and career. We want students to know why they are working so hard, what they are working to achieve. Dressing professionally helps us keep focused on our professional goals. Additionally, our professional uniforms remind our community that we are not alone. Our students work incredibly hard, and the road is not always easy. But students are not doing this hard work alone. While teachers are always there to help, it is also important for them to recognize the power of their peers. As in sports, they are a team, visibly united by a uniform. As they look around in their classes, they see their teammates – people they can rely on for support, people who will lift them up when they’re struggling, people who will push them to achieve more than they thought possible. At the end of the ceremony, students flow out of the gymnasium, ready to attend their first high school class. They have ties around their necks, though it is evident that they have varying levels of clarity on how to form those knots. One thing they are all clear about, though, is that the bar has been raised. The tone of professionalism, ambition, and drive has been set. A cohesive, united team has been formed. The journey to college has begun.